Dahab Gaime, DDS, is an enterprising and compassionate dentist who puts bright smiles on the faces of the Oakland, California community at Oakland City Dental. Her approach to treatment begins with you, the patient! She begins each session with a conversation to help her understand and assess your concerns. Afterward, she’ll delve into your examination, review her diagnosis with you, and discuss all of the available treatment options. Finally, you’ll both come to an agreement on any treatment options you may pursue. Dr. Gaime believes in providing her patients with the best care available, and to that end, she is committed to continuing her education and training. She’s frequently enrolled in continuing education classes and is aware of advances in the field of dental surgery. Her appetite for knowledge has given her extraordinary experience in a number of different areas of dentistry, from cosmetic and restorative dentistry to surgical treatments and root canals. 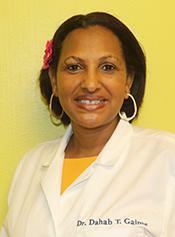 Dr. Gaime earned her Doctorate of Dental Surgery from Howard University. She went on to complete her dental residency at the University of California, San Francisco, where she had worked as a researcher prior to her dental school studies. She is currently a member of the Alameda County Dental Society, the California Dental Association, and the American Dental Association. Dr. Gaime is looking forward to making your trip to the dentist informative, effective, and comfortable!